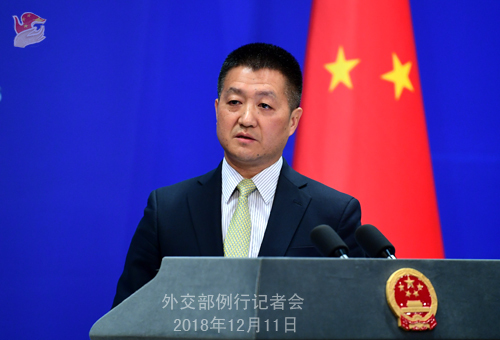 At the invitation of State Councilor and Foreign Minister Wang Yi, Mohammed bin Abdulrahman Al-Thani, Deputy Prime Minister and Minister of Foreign Affairs of the State of Qatar, will pay an official visit to China on December 12. In recent years, the China-Qatar relations have been developing with good momentum. The two countries have established strategic partnership, conducted extensive cooperation in such areas as energy, economy and trade, culture, investment and finance, and maintained sound communication and coordination in international and regional affairs. This year marks the 30th anniversary of the establishment of diplomatic ties between China and Qatar, on which President Xi Jinping and State Councilor and Foreign Minister Wang Yi have sent congratulatory messages to Emir Tamim and Deputy Prime Minister and Foreign Minister Mohammed respectively. China attaches high importance to developing the China-Qatar relations and is willing to maintain friendly exchanges with Qatar at various levels, deepen mutually beneficial cooperation across the board within the framework of the Belt and Road and scale China-Qatar relations to new heights. Q: State Councilor and Foreign Minister Wang Yi gave a speech today. One of the things he talked about was how China will defend the rights of Chinese citizens overseas, saying that China won't sit by and watch Chinese citizens being bullied. The report I read did not specifically mention the Huawei case with Meng Wanzhou. Can you tell us if he was referring specifically to the Meng Wanzhou case when he was talking about this? A: What you just described is very clear. In the speech he delivered this morning, State Councilor and Foreign Minister Wang Yi made clear China's stern position on protecting the legitimate rights and interests of Chinese citizens overseas. It is the consistent position held by the Chinese government under all circumstances and also applies to the case involving Ms. Meng Wanzhou regarding which we have been lodging representations with the Canadian and US governments. You can also see from our representations with the Canadian and US sides that our position is completely the same with what was expounded by State Councilor and Foreign Minister Wang Yi this morning. Q: According to some German press, German President Steinmeier raised China's human rights issue when meeting with Chinese leaders yesterday. Can you confirm that? What is your response? A: The Chinese side has always been open to dialogues and exchanges in the field of human rights with other countries on the basis of mutual respect. Yesterday, President Xi Jinping and Premier Li Keqiang held talks and met with German President Steinmeier respectively. 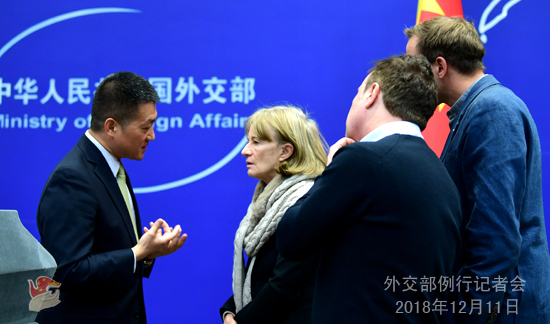 The leaders of the two countries focused on how China and Germany can deepen exchanges and cooperation in a wide range of fields including politics, economy, culture and people-to-people exchanges, science and technology, as well as on how to closely communicate and cooperate in multilateral affairs, jointly safeguard multilateralism and maintain free trade. These were the main topics for the two sides and many positive consensuses have been reached. President Steinmeier said that this trip is the longest visit since he took office as the German president, which is meant not only to reflect the importance he attaches to China-Germany relations, but also to learn of China in a more comprehensive and in-depth way. President Steinmeier expressed his admiration and appreciation for China's tremendous achievements in the 40 years of reform and opening up and the Chinese government's unwavering dedication to expand opening-up. He particularly praised the Chinese government's efforts to lift hundreds of millions of people out of poverty and solve the problem of food and clothing. He emphasized that China and Germany share a wide range of common interests and Germany will continue to promote exchanges and cooperation in various fields with China. I want to point out that the exchanges and cooperation between China and Germany are rich in content. The leaders of the two countries not only maintain regular communication, but also exchange views on a wide range of subjects, including human rights protection, refugee and immigration, and the challenges brought about by digitalized development. China and Germany are different in history, culture, development stage and social system. We do not necessarily agree with each other on some issues. However, as long as we adhere to mutual respect and equal treatment, we can fully engage in constructive dialogues and friendly exchanges to enhance mutual understanding. As President Steinmeier himself said, Germany and China have different historical traditions and experiences. It is normal to have our own views on some issues. As strategic partners, the two sides can enhance understanding through equal-footed dialogues and exchanges on the basis of mutual respect, not through the media hype. Q: The US Treasury Department has included three senior DPRK officials including Choe Ryong Hae on its sanction list. What is your comment? A: The situation on the Korean Peninsula and relevant peace talks have entered a key stage. We hope that the relevant party could focus on the long-term picture and the political settlement process of the Korean Peninsula issue and do more to help alleviate the situation and enhance mutual trust, instead of doing the opposite. Q: US Ambassador to China Terry Branstad made a statement on the International Human Rights Day on December 10. He acknowledged China's progress in many areas, including the lifting of hundreds of millions of citizens out of poverty, but rejected the notion that countries should be held to different standards on human rights. He also levied groundless accusations on China's human rights record. What is your response? A: Yesterday, President Steinmeier who is on a visit in China spoke highly of China's economic and social achievements. He in particular pointed out the Chinese government's success in wiping out hunger for hundreds of millions of people. No one could neglect such an achievement. We noted that Ambassador Branstad also acknowledged China's tremendous progress. We hope that when it comes to the development path and means to promote human rights independently chosen by the Chinese people, the relevant person in the US could also be serious and objective. It is impossible for one harboring bias to correctly understand other countries and increase mutual trust. To think one's standards are "one size fits all" is blind and has been proven to be wrong in many places. What's worse, it is unethical to use the so-called human rights issue to serve one's political motives. Q: Yesterday, you mentioned frustration on the Chinese side that Chinese authorities were not immediately notified about the arrest of Meng Wanzhou. 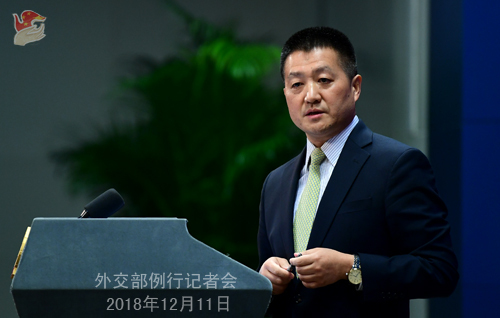 The Canadian Foreign Ministry has said that the Chinese Consular-General was notified on December 1, the day of her arrest and the consular access was provided on that same day. The Chinese Ambassador in Ottawa was also in contact with Canadian officials on that same day to discuss the situation. Can you clarify what the Chinese complaint is on this matter? A: To make two points briefly. First, the consular agreement between China and Canada explicitly stipulates that in a case like this, the Canadian government shall notify the Chinese diplomatic missions in Canada without any delay. Second, just like what I said yesterday, China was not notified by the Canadian side the earliest time possible. Q: The UN Intergovernmental Conference on Migration, currently underway in Marrakech, Morocco, adopted the Global Compact for Safe, Orderly and Regular Migration (GCM) on December 10. What is China's comment on this? A: The GCM has been successfully adopted with the support of more than 150 countries at the UN Intergovernmental Conference on Migration. The Compact is the first global document for the international community to coordinate and solve migration issues in a comprehensive way, providing a global framework for cooperation in strengthening global migration governance. While calling for the strengthening of the protection of migrants' rights and interests, the Compact also clarifies the distinction between refugees and migrants, illegal immigrants and normal immigrants, and regards respect for sovereignty as its guiding principle, which is consistent with the purposes and principles of the UN Charter. In addition, the Compact is not an international convention and is not legally binding. States have the right to implement the Compact on a voluntary basis in accordance with their national conditions. These are also the broad consensus of the international community. The Chinese government has been deeply involved in the Compact negotiations and welcomed its adoption by the Intergovernmental Conference. The Chinese government will, in accordance with its national conditions, implement the Compact in a gradual and orderly manner in accordance with domestic laws and regulations and on a voluntary basis. China is willing to work with the international community to play a positive role in promoting safe, orderly and regular migration. Q: It is reported that the three major mobile phone operators in Japan have basically decided to exclude Chinese products from communication equipment. The Japanese Minister for Internal Affairs and Communications also said today that he hopes Japanese operators will strengthen measures to ensure network security. What is China's comment? A: Yesterday I actually answered a similar question. I will not repeat my answer here. You can check our online transcript of the regular press conference of the Ministry of Foreign Affairs. We have noted that after the Japanese side promulgated the relevant documents, the Chief Cabinet Secretary of Japan, Mr. Yoshihide Suga, made a clear public statement. I want to emphasize here that we have always advocated that all countries in the world should promote trade and investment cooperation on the basis of mutual respect, equality and mutual benefit. Those who fabricate various unwarranted reasons, even for political purposes, to obstruct investment and cooperation, frankly speaking, will only end up hurting everyone and will definitely be detrimental to themselves. We hope that on this issue, the country concerned can bear in mind the long-term interests and adopt an attitude that is responsible both to the international community and to itself. Q: You said that the Canadian government did not inform China immediately about the arrest of Ms. Meng. How many hours after her arrest were Chinese officials in Canada informed? A: You have been trying in the past two days to frame your questions in different ways. I have already made my answer clear. First, I can tell you unequivocally that the consular agreement between China and Canada explicitly states that in a situation like this, the Canadian government has the responsibility and duty to notify without any delay the Chinese diplomatic missions in Canada. Second, I want to repeat that the Canadian side failed to do that. The Chinese side first learned about the situation from other channels. Third, I want to stress again that the Chinese side lodged stern representations with the Canadian side as soon as we learned about the situation. Q: Can you tell us through what channels China learned about this? A: I cannot offer you all the details here. You should first ask the Canadian government whether they have fulfilled their duties. Q: If I ask the Canadian government, they are going to say that they did the correct thing. It might be a good idea if you could explain what specially the complaint is, how many hours after it happened was the Chinese side notified by the Canadian government? A: You may ask the Canadian government whether the Chinese side approached the Canadian government first or the Canadian government notified the Chinese diplomatic missions first. Q: Yesterday, a Japanese man was sentenced to 12 years in prison in China. Could you tell us why he was sentenced and give us detailed information? A: As for the specific case, I would refer you to the competent authority. I can only tell you that the relevant departments in China will handle the case in accordance with law. Due to scheduling reasons, the Foreign Ministry's regular press conference on December 12 (Wednesday) will start at 14:30 at the same venue.